I was born in the heartland of America. My great great grandfather came here from Ireland. I grew up listening to all kinds of music and was fortunate enough to play with some very talented and soulful musicians right out of high school. It was a time when you could go on the road, play music and make a living. I played with everyone from Brenda Lee to Maynard Ferguson and had a ball. A few years back I started listening to Irish music and it it literally struck a chord with my ancestral roots. I love pure traditional music. 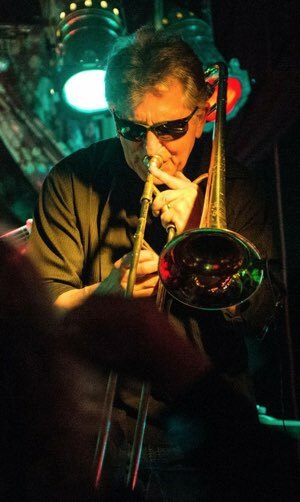 Over the years, and no doubt through the musical experiences he mentions above, Larry’s been able to match his musical sensibilities to the slide instrument, with the result that today his musicality and trombone playing are easily in a class by themselves. One of my personal favorites from Irish American is a marvelous, arranged-on-the-fly, trombone choir: Annie McMahon. Clan McCabe is nothing short of a trombone power ballad. (The euphonium is used here to great effect, too.) Is some of this music shades of Trombone Shorty? You bet! So, check out Larry McCabe’s Irish American — as in right now!